Tinnitus is often thought of as a ringing in the ears, but it describes any abnormal noise that seems to be coming from inside the ears or head. In addition to ringing noises, it may involve humming, whistling, buzzing, hissing or roaring sounds. Tinnitus is a symptom of another medical issue, rather than being a condition on its own. For example, it can result from a build-up of earwax, a middle ear infection (acute otitis media) or hearing loss. Alternatively, temporary tinnitus can also occur from exposure to a sudden loud noise or a blow to the head. Mild or temporary tinnitus is common, whereas only a few people experience severe symptoms. The ear is made up of three main parts: the outer ear, middle ear and inner ear. 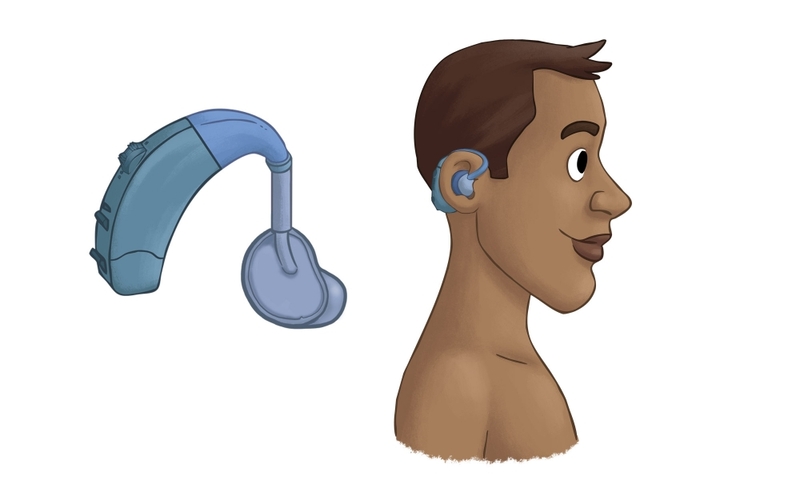 These parts work together to control both hearing and balance. 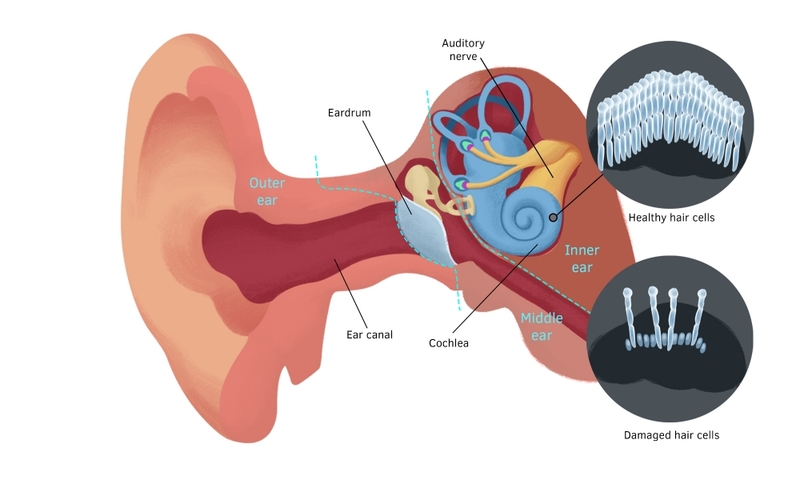 The outer ear collects sound waves and channels them through the ear canal to the eardrum. The middle ear is an air-filled space that contains three tiny bones, known as the malleus (hammer), incus (anvil) and stapes (stirrup). These bones pass sound waves to the inner ear by vibrating together at a rate controlled by the eardrum. The fluid-filled inner ear then converts sound waves into electrical signals, which are sent to the brain for processing. A common cause of tinnitus is damage to tiny hair cells (cilia) in part of the inner ear called the cochlea. When this occurs, the hearing signals may be disrupted or sent to the brain at random. Damage to hair cells is often a natural part of hearing loss that occurs with age. The hair cells (cilia) of the cochlea become damaged with age, resulting in disruption of hearing signals. Certain medications, including non-steroidal anti-inflammatory drugs (NSAIDs), antibiotics, antidepressants, diuretics and chemotherapy drugs. In some cases, more than one of these factors may play a role in tinnitus, while in others, the cause may never be known. Tinnitus is broadly classified into two types: subjective and objective. Subjective tinnitus describes internal noises that can only be heard by you. It is the most common type of tinnitus and is usually due to another problem with the ears or hearing. In rare cases, tinnitus noises can also be heard with a stethoscope by your doctor. This type of tinnitus, known as objective tinnitus, is often caused by abnormal blood vessels in the ears or problems with the jaw joint (temporomandibular joint) and surrounding muscles. Objective tinnitus caused by abnormal blood vessels is also sometimes known as pulsatile tinnitus because the noises feel and sound like they are pulsing in time with the heartbeat. It is often possible to successfully treat objective tinnitus when the cause can be identified. These noises tend to be more common in quiet situations or during times of stress and tiredness. In contrast, some people may find a television, radio or other everyday noise to be painfully loud, even at a low volume. A diagnosis for tinnitus is usually made by asking about your symptoms and looking in the ears with an instrument called an otoscope. Your doctor may also be able to rule out an underlying medical condition by looking closely at the head, face, neck and body. If the cause of tinnitus requires further investigation, you may be referred to an audiologist for a hearing check, or to an ear, nose and throat (ENT) specialist and/or neurologist for further examination. 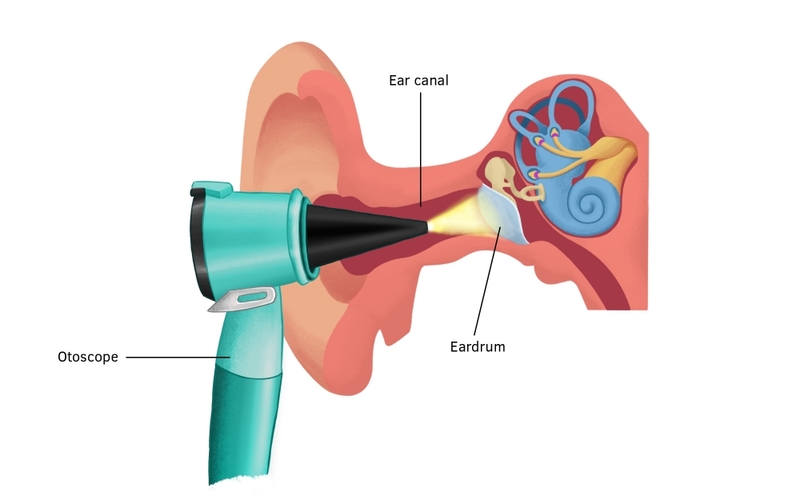 Examination of the ear with an otoscope. If the cause of tinnitus is identified, your doctor may first look at treating the underlying condition. For example, you could be prescribed antibiotics for a middle ear infection, or antidepressants for depression. Alternatively, a build-up of earwax might be treated with ear drops, or removed by your doctor. In cases where a particular medication is thought to be making tinnitus worse, your doctor may suggest modifying the dose, or switching to a different medication. As stress can make tinnitus worse, it may be useful to try relaxation or stress-management activities, such as gentle exercise, yoga, tai chi, calming music or massage. Similarly, joining a support group may provide a good source of information and encouragement. In some cases, it may help to avoid factors that aggravate tinnitus, such as alcohol, caffeine, nicotine and loud noises. If your tinnitus is made worse by silent environments, you may wish to maintain a low level of background noise by keeping a radio on or a window open. This may be particularly useful just before bedtime. If your tinnitus is connected to hearing loss, you may be fitted with a hearing aid to help pick up sounds you would not usually hear. This aims to mask internal tinnitus noises while reducing your strain to hear quiet sounds. A hearing aid behind the ear. In cases where your hearing is normal, a masking device may be recommended instead. These devices are fitted to the ear like a hearing aid and are used to cover up tinnitus by emitting a constant low level of white noise. Tinnitus retraining therapy involves counselling combined with specialised sound therapy sessions. Counselling sessions focus on your understanding and awareness of tinnitus, to help you to deal with any negative feelings and stress. Sound therapy involves wearing an ear device that plays specialised tones matched to your personal tinnitus noises. Depending on your symptoms and preferences, sound may be played for anywhere up to about 20 hours per day. Together, these sessions are designed to make you forget about tinnitus and accept it as normal. Sessions are usually carried out by a hearing specialist (audiologist) or psychologist. Cognitive behavioural therapy for tinnitus may be an effective option if you are experiencing mental health issues related to tinnitus, such as depression or anxiety. Talking to a psychologist about your negative feelings may improve your coping skills and overall outlook towards tinnitus. Tinnitus affects people in many different ways. For example, some people may experience mental health issues or difficulty sleeping (insomnia) if the symptoms cannot be controlled. However, others can successfully manage symptoms and lead a normal life. Although long-term tinnitus is unlikely to clear completely, it often becomes less noticeable over time. In some cases, the chances of developing tinnitus may be reduced by avoiding exposure to loud noises or certain medications. For example, you may wish to protect your hearing with ear plugs or protective equipment if you work in a particularly noisy environment, or when attending a live music performance. Similarly, turning down the volume of speakers or earphones while listening to music is usually recommended. Your doctor will also be able to advise if any medications you are taking are causing tinnitus or making symptoms worse. In these situations, your doctor may reduce the dose or change to a different medication.